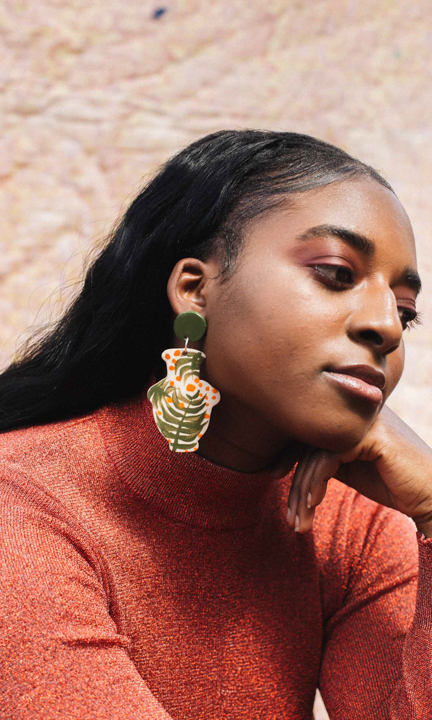 After a year spent refining her range, Adelaide ceramicist Ayesha Aggarwal has moved into wearable art, releasing a line of ceramic jewellery. Adelaide ceramicist Ayesha Aggarwal started making ceramic jewellery in the hopes of bringing a less time-intensive product to market, compared to her larger format plates, pots and vases. The reality fell short of her expectation. Ayesha Aggarwal will appear at Gilles at the Grounds’ Bazaar event happening Saturday and Sunday 1-2 December at Adelaide Showground. “I just thought it would be nice to make jewellery. I wanted to make something that would be quicker and easier to produce, but, as I’ve found, that’s not the case,” Ayesha laughs. Ayesha started working on the range at around Christmas time last year, and has just recently built up enough stock to bring her concept to market. The wearable designs mimic the plant life-inspired pots and vases Ayesha has already released to market. She has an expansive range, due equally to her prolific and easily distracted nature as an artist. “I seem to work a bit erratically. I make a bunch of stuff and then I’m like ‘Ugh, I’m done with this design – next!’” Ayesha says. Although the pieces are more difficult to create than she anticipated, Ayesha has found joy in creating beautiful objects that people can incorporate into their daily lives. “I really love making them and I don’t know, they make me happy when people wear them. I’m pretty happy with how they look on everyone too, so maybe I’ve got something that works,” she says. Ayesha will appear at Gilles at the Grounds’ Bazaar event this weekend, happening Saturday and Sunday 1-2 December, and you can also find her wares at Urban Cow Studio, JamFactory and Art Images Gallery, as well as on her website.